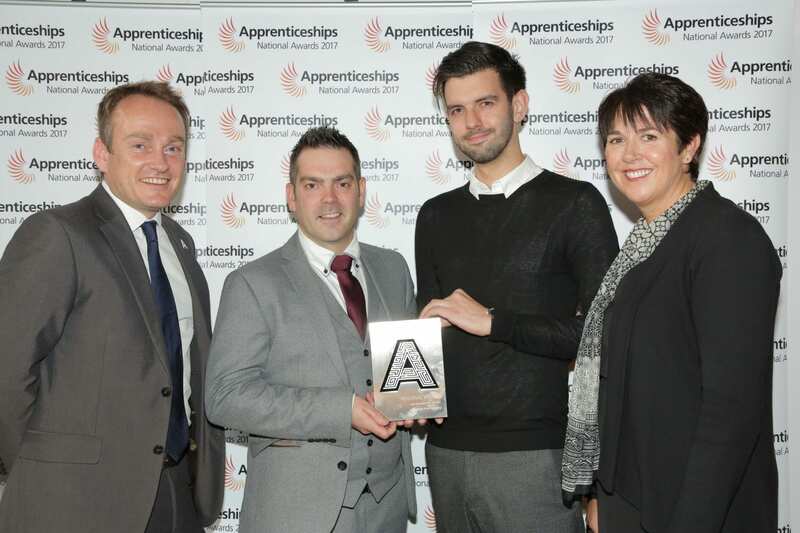 One of Nelson and Colne College’s key employer partners won an award and an apprentice scooped a Highly Commended prize at the North West Regional Final of the National Apprenticeship Awards 2017. Seafood Pub Company’s unique partnership with NCC won the Large Employer category at the event at the Titanic Hotel in Liverpool, wowing the judges with its innovation, while Sandra Shaw was awarded a Highly Commended prize in the Higher or Degree Apprentice category. The gastropub chain operates at 12 sites in Northern England and currently has 11 apprentices working within the business, and has 28 full-time employees who were previously apprentices through the partnership with NCC. The company’s Apprenticeship programme has improved staff retention rates, reduced wage costs by 4% and improved standards, ensuring a higher quality product and service is delivered. By 2018, the company will also have invested £100,000 into the training and development centre it has at Nelson and Colne College. Mark Taft, Head of Kitchen Operations at Seafood Pub Company said: “We’re absolutely thrilled to win this award. Our much-valued partnership with Nelson and Colne College was already award-winning, and this latest accolade underlines what a fantastic, ground-breaking education/employer relationship it is. “We have demonstrated a real commitment to Apprenticeships and have expanded the offer to different areas of our growing business which we have ambitious plans for. Meanwhile, Sandra, who is Operational Manager at Castle Supported Living, a registered charity based in Clitheroe, is delighted with her Highly Commended Award. Sandra owes much of her career development to the Apprenticeship programme. She joined Castle Supported Living in 2001 on a part time basis and in the 16 years that have followed, she has completed Health and Social Care qualifications at Levels 3 and 4 and a Level 5 Leadership qualification. Her skills have delivered positive change at Castle, including reducing staff turnover to below 3%, significantly below the 11% rate nationally, and this is recognised by Skills for Care as an example of best practice. Sandra said: “I am absolutely overwhelmed to receive this prize. It’s a brilliant feeling. I would never have imagined it. I would like to thank everybody at Castle for their help and my assessor Jean Ringham in particular at Nelson and Colne College who has been wonderful with her support and guidance. Seafood Pub Company will now progress to the National Final held in London on 18th January, 2018, where the company will also be in the running to feature in the prestigious Top 100 Apprenticeship Employers List 2017. News of both NCC nominees collecting awards at the Regional Final has thrilled the college’s Apprenticeship Team. Barbara Livesey, Director of Apprenticeships and Training at Nelson and Colne College, said: “We are all extremely proud that both of our nominations collected awards at the Regional Final of the National Apprenticeship Awards. “Employer partnerships are central to the college’s purpose and it is extremely satisfying to see our pioneering partnership with Seafood Pub Company recognised in such a renowned and competitive awards programme. To find out more about Apprenticeships with Nelson and Colne College, employers can contact 01282 440319. There will be a special Apprenticeship Open Event at Nelson and Colne College on Monday 23rd October from 5.30pm and 7.30pm where those looking at an Apprenticeship route will have an opportunity to speak directly to a wide range of employers. Employers can also benefit from a networking opportunity from 4pm. Contact Gabriella Shaw at g.shaw@nelson.ac.uk or call 01282 440289 for more information.